The dairy market in South Korea was once negligible in terms of consumption in the 1990s: consumption of dairy products was even missing in the diet of South Koreans, and whey was prohibited in certain foods, according to the observation by President Tom Suber of the US Dairy Export Council. Over a decade’s development, the total production of the dairy market in South Korea has reached approximately 5.3 trillion won (US$5.2 billion) in 2009. The dairy processing industry has also become the third largest industry in food processing sector. 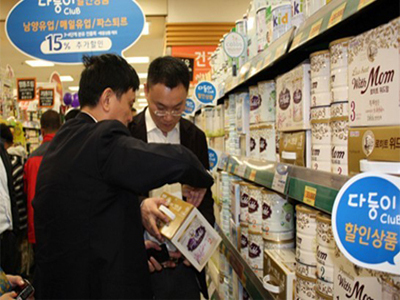 Retails sales of cheese have seen the strongest retail sales growth in the dairy market in South Korea. In 2011, retail value sales of cheese increased by 15 percent to reach $333 million. This displays the increasing familiarity and acceptance South Korean consumers have with the western diet. It also has to do with the great marketing efforts by some international dairy firms in order to expand the overseas market by initiating television cooking shows, applications seminars, trade shows and so on. One of the leading proponent countries is the United States, which dominates the South Korean imports of dairy products in almost all categories, including cheese and whey. Imports from the United States accounts for 31 percent of the importing market share. Performance of yoghurt and sour milk drinks is also delighting, due to the increased awareness of the importance of probiotics on health. According to statistics from the Ministry of Food and Drug Safety, sales of probiotics within overall functional health foods amounted to KRW52 billion in 2012, which reflected 28 percent increase on the previous year. Drinking milk products have been widely accepted by consumers, thus this market is relatively matured. Currently value growth of drinking milk products is keeping a stable 3 percent as recorded in 2014. The dairy market in South Korea is pretty open to the main dairy product producers in the world. South Korea has both free trade agreement with the EU and the United States. Thus the dairy market in South Korea is an exporting target for these competitive producers. In 2009, a total value of $500 million dairy products which equaled to 175,801 tons is imported by the dairy market in South Korea. These products are able to win the hearts of South Korean consumers with their premium quality and lower price, especially in a market where consumers strongly favor these features. Thus the dairy market in South Korea is attractive to international companies.